With the holidays rapidly approaching, we’ve already gotten a great gift to kick off the winter months. 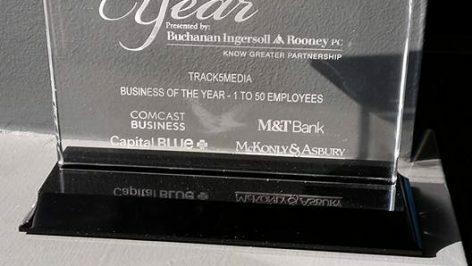 After taking home the “Business of the Year” award a few weeks ago, we recently learned that our fearless owner Oliver Feakins was recognized as one of Central Penn Business Journal’s “40 Under 40.” Capping off a stellar year at Track5Media, this award is yet another achievement for our Track5 team to be proud of. This past month has certainly been an exciting one. With our team hard at work and in the final stages of launching our brand new SeniorCaring website, we were, fortunately, able to take some time away from the office to be recognized for this year’s achievements. Just a few weeks ago, we made our way to the state’s capital for the Central Penn Business Journal’s “Business of the Year” awards. Although we were just excited to be there, the team erupted into cheers when Track5Media was announced the winner in our category. Although we already know how much work we’ve put into this past year, it was a great feeling to be recognized as a company. Oliver brought home the award that now proudly sits in our office. 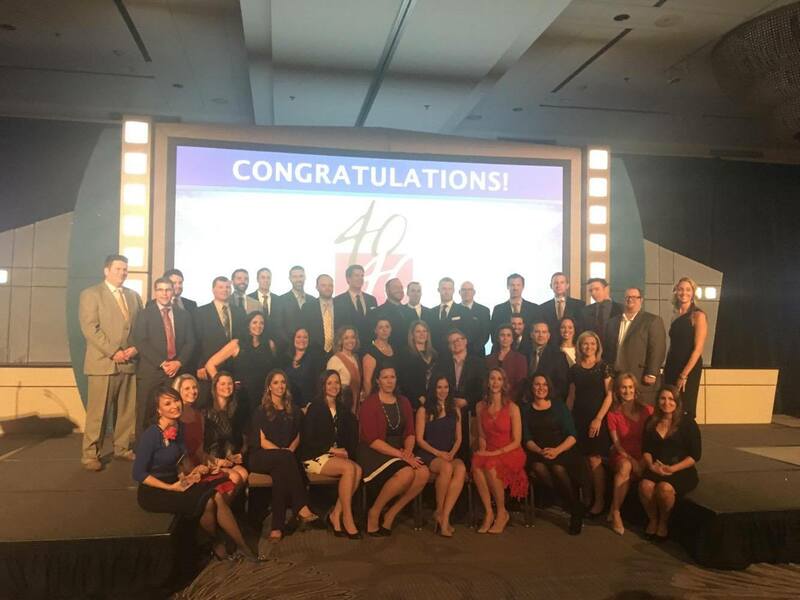 As the CPBJ states, “The Forty Under 40 program celebrates the region’s most accomplished young business leaders who are committed to business growth, professional excellence and community service.” Luckily for us, we have a superstar leading our company that fits all those qualifications. What inspires us most about Oliver’s leadership is his emphasis on Track5Media being a team. He’s able to walk that fine line between boss and peer and uses his expertise and guidance to push us to new levels of awesomeness. As much as we appreciate getting recognized as a company, we also strive to give back to others, especially during this holiday season. While I don’t want to spoil the surprise, let’s just say we have a jolly, bearded business partner that we’ll be working with this Christmas to spread some holiday cheer. Also, we’d like you to keep and eye out for the grand unveiling of our latest project, SeniorCaring.com. This site will be the go-to for all your Senior Caring needs. While we know moving your loved one into senior living can be an emotional and difficult process, our website is designed to link you up with the proper facility and make the transition into care as easy as possible. 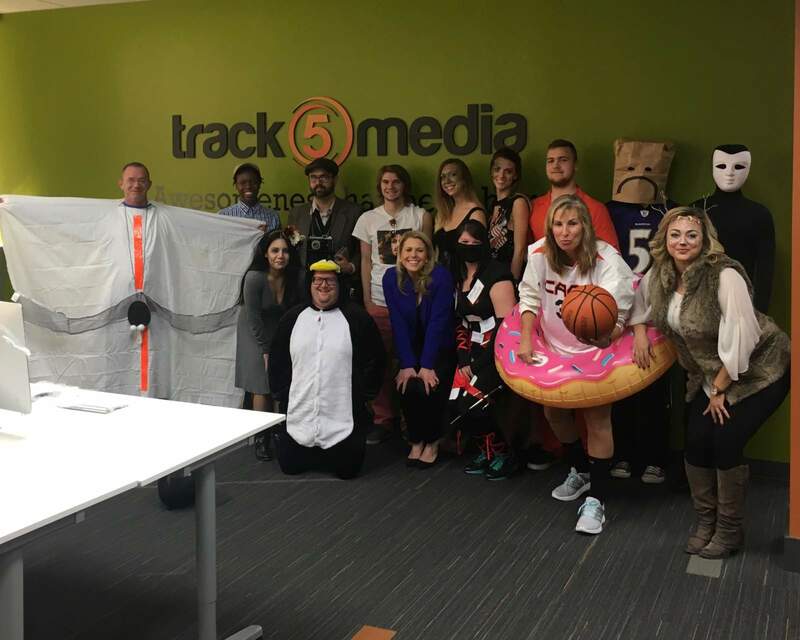 Although it’s cheesy to say, Track5Media truly is a family. Whether it’s dressing up for our annual Halloween party, or hitting the skies to go zip lining on a work retreat, our company is more than just a group of people punching the clock, we’re a team that strives to produce the best possible products and content. 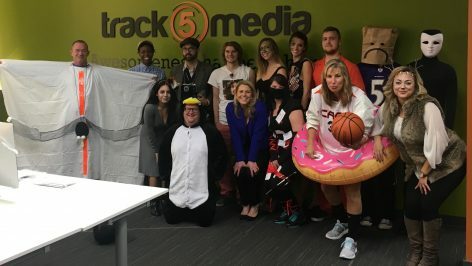 So, in the spirit of the holiday, many of our staff members have decided to share what we’re thankful for this Thanksgiving, and from all of us at Track5Media, we wish you all a Happy Thanksgiving! So, in the spirit of the holiday, many of our staff members have decided to share what we’re thankful for this Thanksgiving, and from all of us at Track5Media, we wish you all a Happy Thanksgiving! I’m thankful for the opportunity to work with an awesomely talented and intelligent group of people that I can learn from both professionally and personally) every day. I also think there’s a lot to be said about the support that everyone here provides for each other. Everyone has their own story, but whether it be related to a project or even things that impact our people outside of business hours, we really come together as a unified team and everyone genuinely cares and respects one another, which isn’t necessarily customary when it comes to a job. Being thankful for me has taken on a very special new meaning to me this year as many things have transpired in our society and my personal life. Super grateful for all members that make up our super team @T5 as well all my friends and family including my four-legged best friend. Here’s to a great year ahead of being thankful for what we all have and not what we don’t have. I am thankful for my husband and the life we have created with our three children. I am thankful for my children; they give me hope for a great future. I am also thankful for the many family and friends that are in our lives. I am grateful for the amazing team at Track5Media. We spend a lot of time together, so it is a good thing we all like each other. The energy that surrounds me is something I do not take for granted. I know when I am with the people in my life; the world is going to be okay! This year (and every other year of course) I’m thankful for my family and friends who are constantly supporting me with all my adventures, like rescuing a puppy who is absolutely nuts! They’ve all stepped in whenever I’ve needed help, which I’m so grateful for! I’m also so thankful to be working for such a great company, and that I’m surrounded by awesome co-workers every day – It makes being an adult so much easier! I’m thankful for my loving and supportive family, my energetic Dalmatian, and my crazy friends that keep me laughing and smiling throughout the whole year. I’m also thankful for my adventurous spirit which encouraged me to take a chance and move to PA for this incredible job at Track5Media. Our team at Track5 takes ‘loving what you do’ to a whole new meaning for me and I couldn’t be happier to have the opportunity to work with such a supportive and talented group. Oh, and I’m thankful for FaceTime, which makes it easy to laugh with my 18-month old nephew as he runs around the house and coo over my 4-month old niece. I’m thankful for many things. Of course, I’m thankful for the supportive group of friends, family, and coworkers I have. I’m also thankful for growth. This past year I’ve grown more as a person, friend, and loved one more than I could have imagined. Walking into work every day gets me excited. I’m honored to be a member of such an awesome, hardworking team, and I can’t even imagine what the next year will hold. Happy Thanksgiving! I’m thankful that we can become aware of our society, our world, and beyond via the wonderful tool that is the Internet. And while it can show us the most vicious face of humanity, we are similarly exposed to millions of like-minded and positively influential people every day. This access of information holds us accountable to become better human beings and to act based on an increasing knowledge of the world and its issues. I’m thankful that this holiday will arrive and pass many times over and for many people. This time of thanks is celebrating all of those moments when we had enough food, or a safe place to sleep, a network of friends, a stable job, or just the ability to get up and greet the day. I’m thankful for my amazing family and friends, my adorable pup (ok all pups everywhere) and the love and happiness they bring to my world. I am also thankful for new experiences and that I have a rewarding career that allows me to live a fun, awesome life and the ability to fill it with things that keep me smiling and growing every day. ..Oh and pizza! I mean.. because how can we not be thankful for pizza?! As cheesy and totally expected as it may seem, what I’m most grateful this year, outside of friends and family, is my time at Track5Media. I am just beside myself to be working with such a hardworking, talented group of people. The grounds for Business of the Year is well founded! My time here and what I’ve learned will not be taken for granted. Naturally, like every other human being, I am also grateful for my family and friends. I am lucky to know some absolutely extraordinary people but to receive unconditional love and support from them and the opportunity to call them my dearest friends is more than I could ever hope for. They constantly challenge and inspire me, even when they are unaware of it. As for my family, I could go on for days. But I will say this: they are the reason I’m grounded and just so darn awesome. The sacrifices my parents made and the challenges they went through will forever be imprinted in my brain and will always be the number one thing I am grateful for. Cultural Fit: Hiring Tool or Disguising Bias? It is hard for a business to be successful without a formidable team helping pave the way. That is why hiring and retaining quality employees is important. When it comes to hiring employees, you always hear about cultural fit or workplace culture playing a major role in their success. Look at Zappos or Google, for example. I’ve even written about creating work culture to foster innovation. This is not that blog post, however. There are many that think that cultural fit is a new form of discrimination. 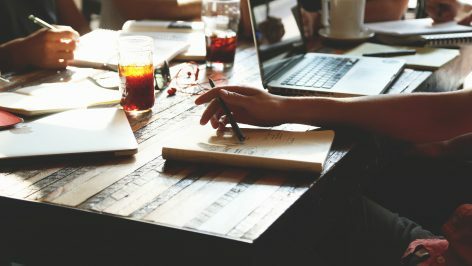 Yes, a positive work environment is beneficial to your company productivity. But if everyone thinks and acts the same, who will ever ask the hard questions that spur innovation? More importantly, what is cultural fit? How does a company quantify or measure something intangible? A quick Google search will give many definitions from various influencers. Why? Because cultural fit is something that is recognizable, but generally immaterial. Workplace culture is based on the behaviors, beliefs, and values. The culture of a company refers to the way things are done. When a company is looking for a fit, they are looking for an alignment between the company core values and the candidate’s attributes, skills, and qualities. Obviously, there are many advantages to hiring for a fit culturally. Even if you are not able to really measure it, you know when a new hire is missing that cultural fit. Those that fit into their company will experience greater job satisfaction, perform better, and will likely stay at the same company. Cultural fit can be make-or-break for a new hire. Are internal bias’ interfering with your recruitment process? The idea behind hiring for the right fit is that the manager wants to work with people that are like them. Managers want to mentor people that seem like versions of themselves. There is nothing wrong with that. After all, it is human nature to want to surround yourself with people with the same values or behaviors. So, when does this become an issue? 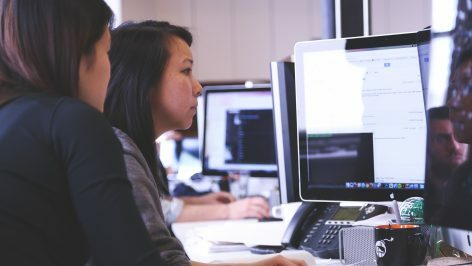 Clearly, there is a need to hire for fit in the workplace, however, it becomes an issue when you are using cultural fit as a reason not to hire someone. If you don’t even know how to measure your company culture, how could you possibly use it to eliminate a potential candidate? Some companies are using this idea of culture to discriminate against employees based on their gender, class, race, sexual orientation, or education. That is not to say that companies are purposely discriminating against prospective employees. But, when you start letting personal bias get in the way of hiring the right candidates, you are putting your company at risk. Without diversity, you don’t get any out of the box thinking from your team. Having diverse hires allows employees to learn from each other, innovate processes, and ultimately grow your business. While you may be looking to hire someone you would want to drink a beer with, you may be turning away skilled employees that could really help your company because they don’t fit. When everyone in your office thinks the same way, no one will challenge anyone. If no one is challenged in their thinking, you can create a sense of complacency and overconfidence. No one will ask questions about products or processes that will spur innovation and grow your business. Always remember that you should always be looking to diversify your employees. When you have employees with various life experiences, backgrounds, and values, you have the perfect ingredients to encourage changes that will grow your business. So, how can you still hire for fit, but ensure that you are not turning away quality hires based on biases? Create two lists. On one of them, write down your organization’s core values. These should be the same values you want to see from every candidate. On the second list, write down your company’s cultural patterns. There is a reason that I want you to make two lists; those values should remain separate. Look for your core values in a candidate first, and then see what cultural patterns fit your company. Remember that if your corporate culture is open to new ideas, you can build teams that can leverage each other’s differences. By having diversity in your company, your teams will be able to take smart risks and learn new methods of doing things. Most importantly, make sure that if you are eliminating a candidate for not being a cultural fit, explain that decision. You should be able to look at exactly which values the candidate does not emulate. If you cannot quantify a cultural reason for eliminating a potential hire, do not eliminate that potential hire. 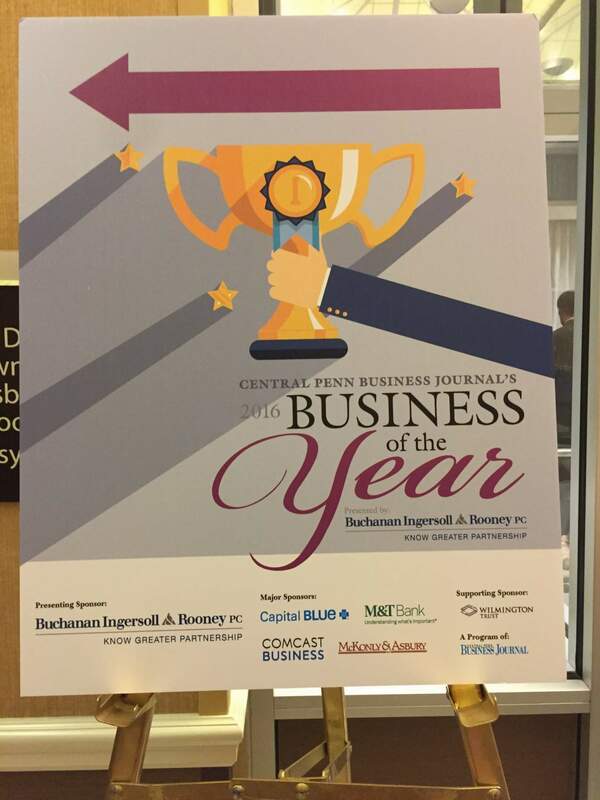 As our slogan states, “Awesomeness Happens Here,” and fortunately for us, awesomeness happened at the Central Penn Business Journal’s award ceremony last night. A few months ago we received the news that Track5Media had been chosen as a finalist to win the Business of the Year award in our category. Our awesome team was thrilled at the aspect of receiving the honor, so when we made our way into the Harrisburg Hilton last night, we were quite hopeful. The past few months have been hectic for everyone, and with the holidays rapidly approaching, our team has been putting in extra hours to create the best possible product. To hear our name announced was a great feeling for our team and made all the hard work we’ve been putting in completely worth it. “Winning was more exciting than I ever could have imagined. 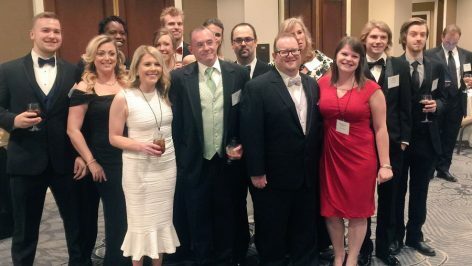 Words can’t express how proud I am of our team and of our fearless leader, Oliver Feakins,” said Internet Marketing Manager, Margaret Colebeck. To see the happiness and pride that Oliver, our president, had towards our team really put into perspective how far we’ve come. As we passed the award around between our two tables, we weren’t just a group of people working for a company; we were a family. Sharing stories, drinks, and laughs really showed the bond we all have. We didn’t win this award because we made a lot of money. We won it because we created an atmosphere that promoted innovation and pushed each and every one of us to create the best business possible. It’s now been about 12 hours since we received the business award, and everyone is back at his or her desk, plugging away at our next big project, Senior Caring. In a few short months, we’ll be launching our most ambitious website yet, SeniorCaring.com. Here, users will be able to find the perfect caregiving home or service for their senior as well as get information on ailments, injuries, and other medical issues. “I’m excited and hopeful that we have an incredibly successful senior caring launch, and I hope we can open new doors for our clients on both the trucking and healthcare sides,” said Kelsey Herbst, Junior Account Manager. 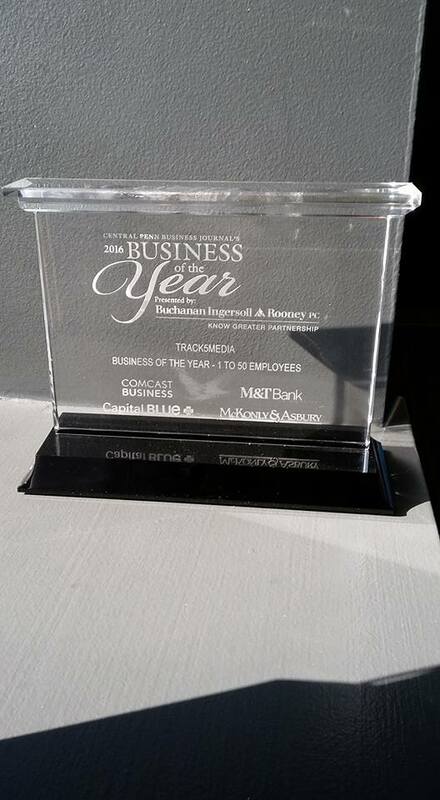 Despite winning such an awesome award, our team continues to strive to innovate, inspire, and succeed. The concept of microblogging seemed at first like a pipe dream, something that could only cater to the alleged ever-diminishing attention span of the modern social media user. Yet 317 million active users later, micro-content platforms like Twitter are still going strong (at least for now). There’s something to be said about the short exchange of a tweet, a Tumblr post, Snapchat, and the soon-to-disappear content of Vine. Character limits and short recording times coax users into streamlining their messages or concepts, something that actually requires more thought than you might expect. In a sense, these restrictions are freeing, allowing people to become equal in how much they can say or express through video. 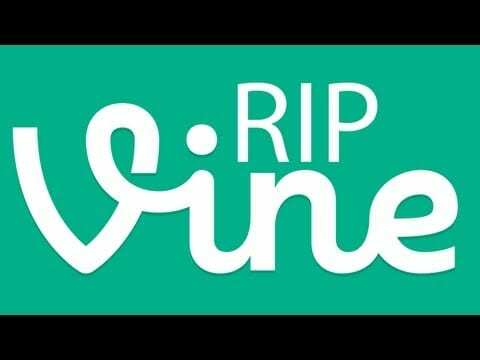 Before Vine’s official launch on January 24, 2013, creators Dom Hofmann, Rus Yusupov, and Colin Kroll were unsure just how the platform would be used. Initially, their idea centered around creating casual glimpses of someone’s life, however, experimentation occurred very early on, ultimately setting the stage for what was to come. Stop motion animations and time lapse quickly became some of the most interesting posts, popularized by users like Ian Padgham and his ability to seamlessly blend the analog and digital worlds. This platform also had its fair shares of ubiquitous memes and pop culture phenomena, introducing the public to constantly repurposed sound bites and themes found throughout the platform. Fast forward to April 9, 2013 and this platform had become the most-downloaded free app in the iOS App Store, gaining over 200 million active users along the way. It seemed like the endless loops of Vine might hold their 6-seconds, yet seemingly timeless place in pop culture, yet recent announcements have confirmed that this app has begun its infinite regression into oblivion. As one of the initial adopters myself back in 2013, I first learned about the impending doom this platform faces through opening the app on October 27th. After making references to Vine-specific memes for months with no one making the connections, it was becoming more and more obvious that the app is, and has been on its way out for some time now. 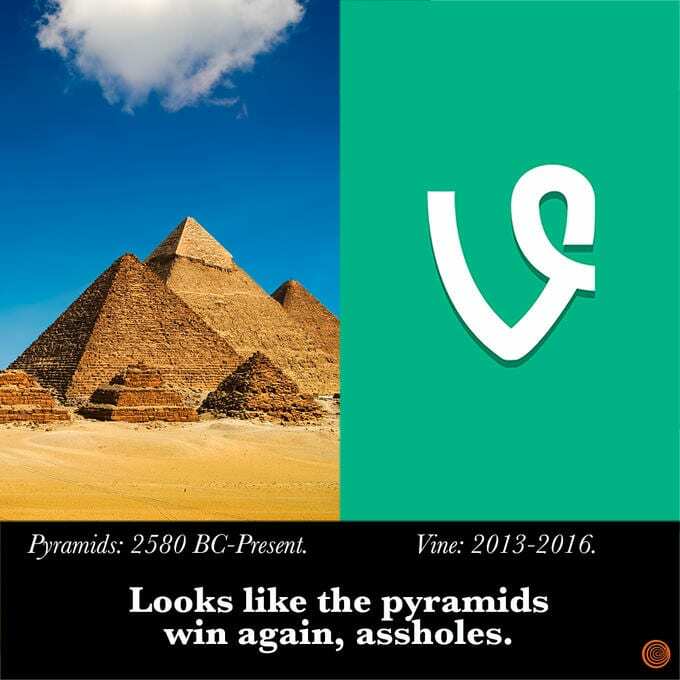 Vine just couldn’t outlive the pyramids – something no one could have predicted. At this point, even the most refined Viners are posting their death-throws and plugs for their other social media platforms like Instagram and Youtube. In all honesty, it’s actually a sad day for all of the people who found their voices through this app. Vine represented a type of storytelling that took on an almost hypnotically comforting repetition of images and sounds, distilling narratives down to something you could watch once without wasting your time, or on an endless loop to your heart’s content. Beyond the infinite 6-second reels, gags, and occasional endorsement, this platform produced a community that might only be comparable to the early days of Tumblr, encouraging real-life meet-ups and collaborations in building connections beyond digital reactions. This, I believe, is going to be an increasingly rare phenomenon and something that we really can’t take for granted anymore. Yes, all good things come to an end, yet if that were ever untrue you might just be watching one of your favorite Vine posts.